Indian Garden is where the riders who are overnighting at Phantom Ranch separate from the day riders and embark on their own private adventure. 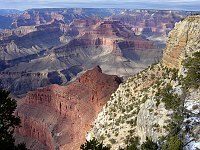 Although they have now come half the distance from the South Rim to Phantom Ranch, a quick look back up at the rim will verify that they have descended two thirds of the total altitude change from the mule corral to the canyon bottom. Most of them will take more than a quick look, however, because from Indian Garden it is difficult to see how that canyon wall could possibly be traveled. But they did it, and they will all feel some degree of pride in their accomplishment. The hard part is over. The gently sloping trail now follows Garden Creek as it wanders down its narrow channel toward the canyon bottom. It is picture postcard beautiful. The cottonwood and willow trees, the lush riparian vegetation, and the peaceful sound of crystal clear flowing water give them the feeling that a new world has been entered. Considering themselves advanced beyond novice rider status by now, they are secure and comfortable in the saddle and most of them will truly relax and enjoy the ride. Whereas it is common to see bighorn sheep at the top of the trail in the morning, deer are what they are likely to see down here. Being unaccustomed to any threat from humans, the animals in the canyon will simply glance up and then go on about their business. This will be a photo opp for those riders who have never before seen a deer in the wild. They will all be looking to the left as Garden Creek separates itself from the trail, tumbling rapidly downward and disappearing quickly into a small rocky gorge. As they pass, their attention will again focus forward and it will be mere seconds before they realize that there is nothing but open air in front of them. Hello Devil's Corkscrew! As they round a sharp bend they will find themselves on the side of a canyon wall, on a narrow ledge, staring down a near vertical drop-off to the valley floor. A valley floor which every one of them will say is at least a thousand feet below, in a canyon large enough be impressive in its own right anywhere but here. A degree of anxiety will return and some will later recall this as the most frightening part of the entire trail. Even Garden Creek had the good sense to detour before it came to this. At the bottom of Devil's Corkscrew they will find friendlier ground, again following along the creek as it gently slopes toward its final approach to the river. The wrangler will probably verify that the Colorado River is not far ahead and comfort them with the assurance that the trail plans no more devilish surprises. A few general comments will be heard and they will relax again, now the hard part is over. The Bright Angel Trail breaks through a small gorge and affords its first view of the Colorado River only when they are literally at the river. There it is, right in front of them. Most of the riders will think it is bigger than it looked in the pictures. All of them will be awed at the energy and power it emanates, and this will be the high point in some memories. As they turn to amble along the comfortable River Trail at the water's edge, if they hadn't realized it before, they will now, this is the ride of their life.